NEW YORK, NY (January 17, 2019) – Engagement Labs Inc. (TSXV: EL) (OTCQB: ELBSF), an industry-leading data and analytics firm that focuses on the social intelligence and its impact on business, today released its TotalSocial® top 10 ranking household products brands in the U.S. based on social influence. The analysis is unique in that it combines offline and online consumer conversations and is based on Engagement Labs’ proprietary TotalSocial data and analytics, which continuously measures the most important drivers of brand performance in both face-to-face (offline) and social media (online) conversations. The brands in the top 10 have earned the highest TotalSocial scores in the category for the last six months, compared to last year six months ending July 2018. 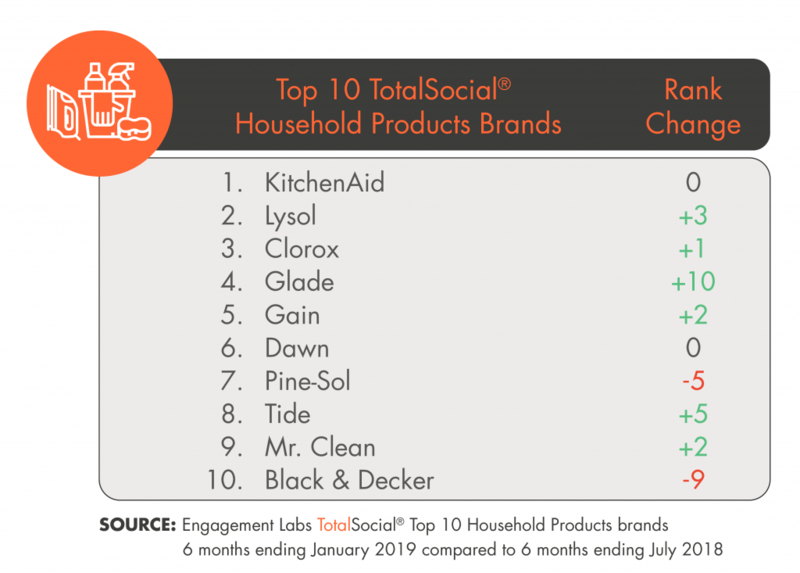 For the second time in a row, KitchenAid holds to top position in the TotalSocial ranking, beating out Lysol and Clorox among “household products,” based on the level of conversation engagement by consumers. The KitchenAid brand is celebrating its 100th year, and announced its 2018 Color of the Year (“Birds of Paradise”). According to Engagement Labs’ report, Glade enjoyed the biggest jump in the rankings, moving into the fourth place from its previous spot at 15, primarily due to increases in offline and online sentiment, and offline influence. The brand recently announced that they will be phasing-out galaxolide, a synthetic musk, from its products. The Tide and Mr. Clean brands joined the top 10 ranking in this report. Tide rose five spots to the number eight spot, primarily from an increase in sentiment, both online and offline. In January 2018, Tide was at the center of a controversy surrounding teenagers eating their Tide pods detergent. The brand’s sentiment has since recovered. Another factor in the improvement may be the brand’s recently introduced new packaging for liquid detergent, which has many people comparing it to the packaging of boxed wine. Mr. Clean moved up two spots from number 11 to land in the top 10. This move was due to an increase in offline brand sharing and offline influence. The brand also recently won an award for their advertising campaign in 2018.